In the early 1960's J. D. Jarvis invited a couple of young brothers to step up to the pulpit ofa local church to sing with him. This was their first invitation to sing outside their own church. They traveled with J. D. Jarvis for a time and while singing at a Lawrenceburg, Indiana church met Ralph Stanley. He invited them to come to his bluegrass festival in McClure, Va. Little did they know that Ralph Stanley would be responsible for the name they had been unable to decide for themselves. Ralph merely introduced them as "The Wilson Brothers". Curnie and Russell performed their lonesome bluegrass sound for twenty four years. They recorded six albums. Among the many songs written by Russell were: Rejoice With Mom and Dad; This Lost Sinner's Prayer; What More Do You Need; Life's Other Side (also recorded by Ralph Stanley); and The Stanley's Will Sing Again. Russell and Curnie also composed the music for Ed Hamilton' s "Lonesome Old Home" which became IBMA's 1998 song of the year. 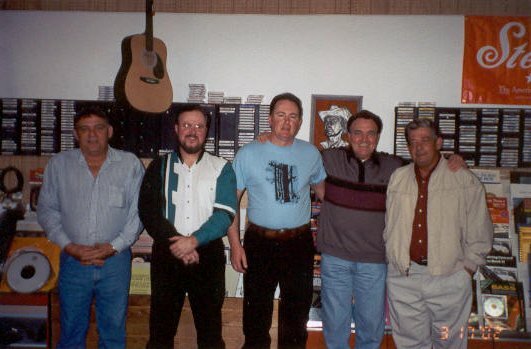 Among those musicians that joined the recording sessions of The Wilson Brothers and The Bluegrass Harvesters are: Larry Sparks; Joe Isaacs; Ron Thomason and Scotty Sparks. Due to poor health, The Wilson Brothers last public appearance was in 1984. Since then Russell has appeared on The Cumberland Highlanders nationally televised bluegrass show since 1998. 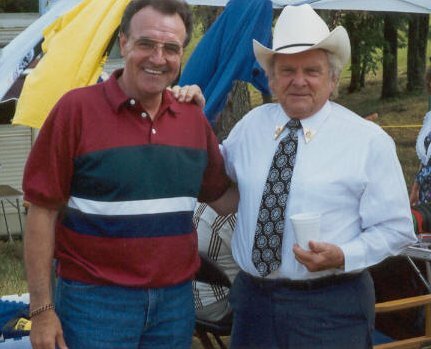 In 1999/2000 Ralph Stanley teams up with Russell on the "Cumberland Mountain Home" CD when they sing "The Stanley's Will Sing Again" and "Lost Sinner's Prayer" while brother, Curnie, joins them to sing "Harbor of Love". 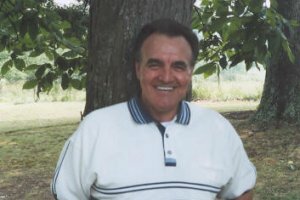 Russell has had the opportunity to sing both tenor and lead with Ralph Stanley. Russell is now working on a new CD for Crosscut Records that should be completed in the summer of 2002. Sammy Adkins and the Sandy Hook Mt. Boys are helping Russell with this project. Several of the songs were written by Russell and are being recorded for the first time. The Cumberland Highlanders TV Show will be taping soon and Russell and The Sandy Hook Mt. Boys will be taping several of the songs from the new CD for the show. Traditional bluegrass has always been in Russell' s life and he hopes to continue to write and record for many years to come. 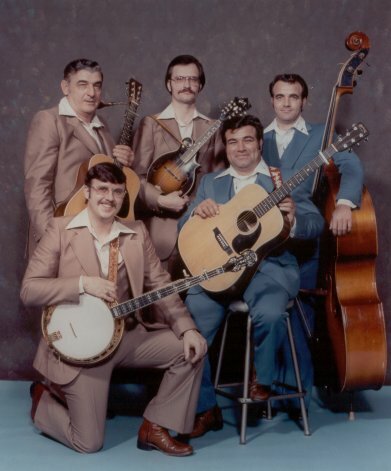 The Wilson Brothers and The Bluegrass Harvesters at a photo session for the cover of "My Ride Is Coming" released in 1979. Back Row Left to Right: Lonnie Bolin; Larry Polley; Russell Wilson. Front Row Left to Right: Denver Jones; and Curnie Wilson. Old friends meet at the Big Hill Bluegrass Festival in Berea, Ky. Left to Right: Russell Wilson and Dr. Ralph Stanley. On the set for a taping of The Cumberland Highlanders national TV show. 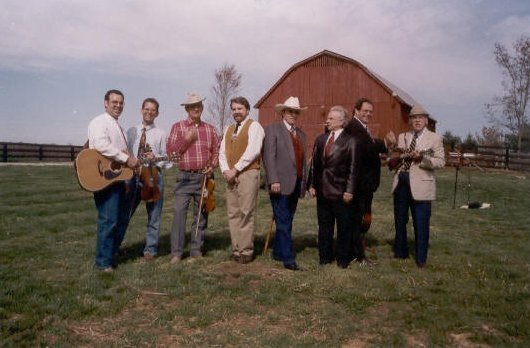 Left to Right: Curnie Lee Wilson; Jimmy Campbell; Claude Harman; Campbell Mercer; Russell Wilson; Dr. Ralph Stanley; Wayne Lewis; and Tater Tate. After a recording session at Stacey's Music for Crosscut Records. Left to Right: Renfro Profitt; Denver Jones; Sammy Adkins; Russell Wilson; and James Lowe.